Hall of Fame defenseman Chris Chelios on the attack during his peak days playing for the Hawks in the 1990s. Look out for Sidney’s weekly dispatches from the front lines of Blackhawks fandom every week during the hockey season. As the 2013-14 regular season begins for the Chicago Blackhawks, this marks the 20th season that I’ve watched the team that was once referred to as Cold Steel On Ice. This run of 20 years has run me through the gamut of emotions as a fan — of course there has been the unadulterated joy of two Stanley Cup Championships but there has also been ownership changes, losing seasons, unpopular trades, the dark days of not being able to catch home games consistently on television and quite a few playoff disappointments. Regardless, I’ve seen some players that captured the imagination and made me say WOW! Through the dark days to the Stanley Cup titles, here are my top ten Chicago Blackhawks. Hossa is known around the NHL as being one of the best two-way players in the game. After losing in the 2008 Stanley Cup Finals as a Pittsburgh Penguin and in 2009 as a Detroit Red Wing, Hossa signed to Chicago as a free agent in the summer of ’09 to provide scoring and leadership to an up-and-coming Hawks team. The move paid off immediately as Hossa scored 24 goals along with 27 assists for a 51 point regular season. Hossa’s greatest moment as a Blackhawk so far came on April 24, 2010 in Game 5 of the team’s first round series against the Nashville Predators. Hossa took a four minute penalty with the Hawks trailing by one goal late in regulation. Patrick Kane tied the game late in regulation and as overtime commenced, the Hawks killed off the penalty and Hossa returned to the ice. It took no longer than ten seconds for Hossa to net his first career Blackhawk playoff goal. The game winner helped the Hawks close out Nashville and eventually helped the team to its first Stanley Cup title in 49 years. Hossa again proved his worth in the 2013 title run, scoring 16 points overall (seven goals, nine assists) in the postseason. After being traded to Chicago from Philadelphia in 2005, Sharp has been one of the NHL’s top scorers, starting in 2008 when he tallied 36 goals and 26 assists for a total of 62 points. In 2012, his best regular season of his career so far, Sharp tallied 71 points, again displayed his consistency with 34 goals and 37 assists. The playoffs tend to bring out the best in players and Sharp tends to make that statement stand. In 2010, Sharp totaled 22 points (11 goals, 11 assists) in the playoffs, playing a big role in the Cup title run and forming a top line with Jonathan Toews and Patrick Kane that has helped define the current Hawks era. In 2013, after a injury filled regular season, Sharp came through big in the playoffs again, scoring 10 goals and six assists. Sharp’s versatility to play wing or center helps make him a constant scoring threat and his contribution to the power play makes him always dangerous. This tandem has been together since 2006 and all they’ve done is shut down the top scoring lines of opponents. Keith’s 2010 season was a coming out party for him as he would win the Norris Trophy for being the NHL’s top defenseman. Known for his scoring ability, Keith tallied 69 points that year, including 55 assists. Keith kept up his offensive numbers in the ’10 playoffs, scoring two goals along with 15 assists. The greatest moment many Hawks fans likely associate with Keith occurred in Game 4 of the Western Conference Finals against the San Jose Sharks when he took a shot in the face from a puck knocking out seven teeth. He would miss only one shift and came back to help the Hawks sweep the Sharks in four games. Seabrook has become known around the league as one the top defensemen never to play in an All-Star game. As the other half of the Hawks’ top defensive pair, this physical standout has developed his game steadily over the course of his career. In 2013, Seabrook endeared himself to more Hawks fans than ever as he would deliver the game-winning goal in Game 7 against the Detroit Red Wings, helping the Hawks steal that series after falling behind 3-1. Seabrook also made the Stanley Cup Finals against Boston his center stage and he delivered another game-winner in Game 4, tying the series at 2-2 and providing momentum that led the team to close things out in six. With two rings for Seabrook, who needs an All-Star game? The tandem of Keith and Seabrook, if kept togther, should continue to give other teams trouble for years to come. When Savard came back to play for the Hawks in 1995, I was just starting to watch hockey on a consistent basis and I’ve only heard stories about how great he was back in the 1980’s. Also, there were the stories of how the Hawks management did Savard wrong in trading him to Montreal for hometown kid Chris Chelios in 1990. Watching old clips and looking up statistics, its easy to see Savard dominated the ice with his nifty moves and passing ability. In the 1985 postseason, Savard showed off his offensive skills, scoring 29 points (nine goals, 20 assists), which still stands at No. 2 all-time for Blackhawks playoff scoring. Savard’s best regular season came in 1988, where he tallied 44 goals along with 87 assists for 131 points. After retiring in 1997, Savard took control of the Hawks as head coach from 2007 to 2009 where he tried to get the Hawks back on track and had a record of 65-66-16 in that span. In his best season, 2008, the team fell three points short of the playoffs (40-34-8 88 points), but that season proved to be a starting point for the team’s future success with cornerstones Jonathan Toews and Patrick Kane. Savard was inducted into the Hockey Hall Of Fame in 2000 and now serves as an ambassador for the team. Born and raised in Chicago, Chelios always dreamed up playing for his hometown team and that wish came true in 1990 when he was traded from Montreal to Chicago for Denis Savard. 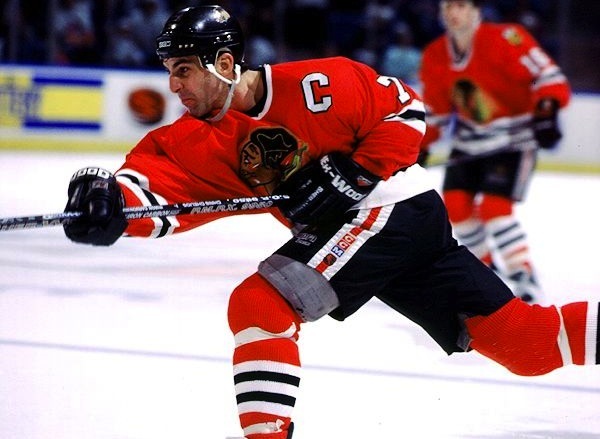 Chelios became one of the best defenseman in the NHL while with the Hawks, collecting numerous awards, including winning the Norris Trophy for best defenseman in 1993 and 1996. Chelios had standout postseasons in 1992 — where the Hawks came up short against the Pittsburgh Penguins in the Stanley Cup Finals– tallying six goals and 15 assists and in 1995, with 11 points overall including seven assists, but ’95 ended disappointingly with Detroit sweeping the Hawks in the Western Conference Finals. Chelios’s regular seasons included a career high 73 points (15 goals, 58 assists) in 1993 and 72 in 1996 (14 goals, 58 assists). With the team in rebuilding mode, Chelios was traded to Detroit in 1999, where he would win two more Cup titles in 2002 and 2008 to go with his first with Montreal in 1986. Chelios was inducted into the Hockey Hall Of Fame in 2013. Standing as a true physical specimen with offensive ability, Chelios has gone down as one of the best defenseman to ever play in a Hawks uniform, his #7, currently worn by Brent Seabrook, should be retired someday.